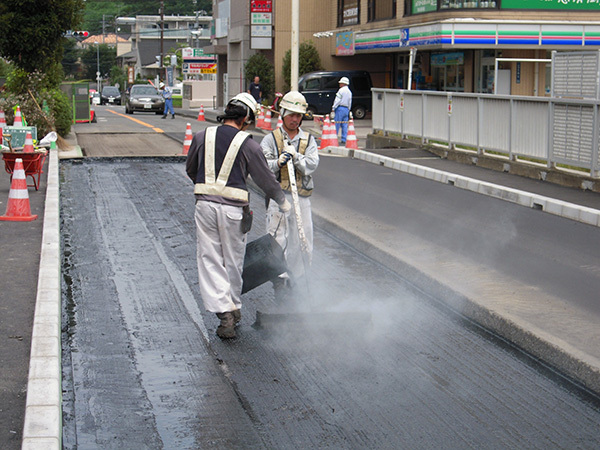 The SEROSEAL SS-B construction method is a hot-applied asphalt membrane-type deck slab waterproofing construction method. In the method, “CATICOAT” is applied on the concrete deck slabs (RC or PC deck slabs) or steel deck plates as the primer, and then the “SEROSEAL SS-B” waterproofing membrane is applied. After application, No.4 silica sand is sprinkled on top to prevent attachment of foreign objects. This method conforms to the standard quality of the membrane-based deck slab waterproofing layer (hot-applied asphalt) waterproofing materials of the “Bridge Deck Slab Waterproofing Handbook”. The viscosity when melted is low, allowing favorable working conditions. Curing is not required after completing the implementation. Compared with sheet-based deck slab construction methods, large-volume implementation is possible.